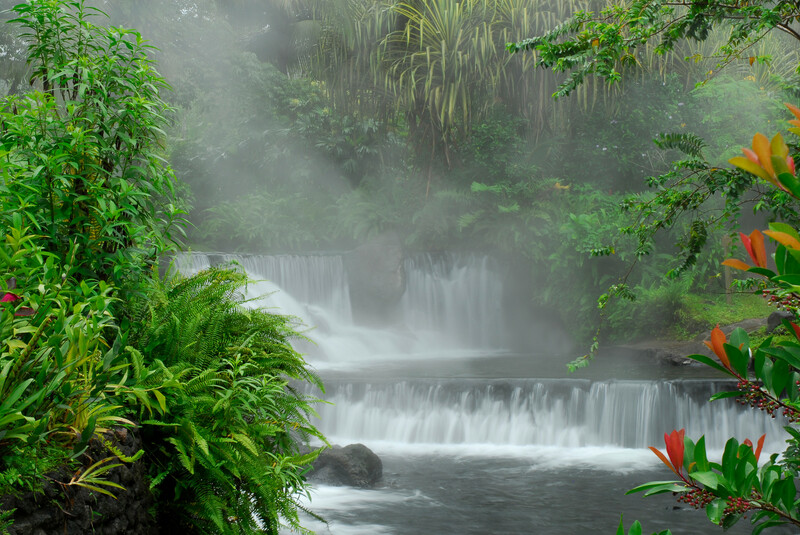 During your vacation to Costa Rica—specifically to the Arenal Volcano area—enjoy the Tabacón Hot Springs that emerge directly from the majestic Arenal Volcano. 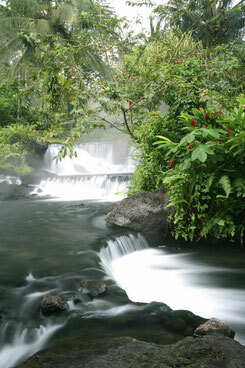 The Tabacón Hot Springs are made up of natural pools formed by cascades and waterfalls flowing into a series of paradisiacal gardens with more than 500 species of flowers, plants, and trees. 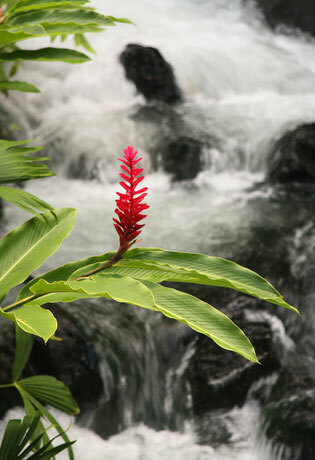 We invite you to swim and dip in all the pools, waterfalls and natural springs at Tabacon Hot Springs. 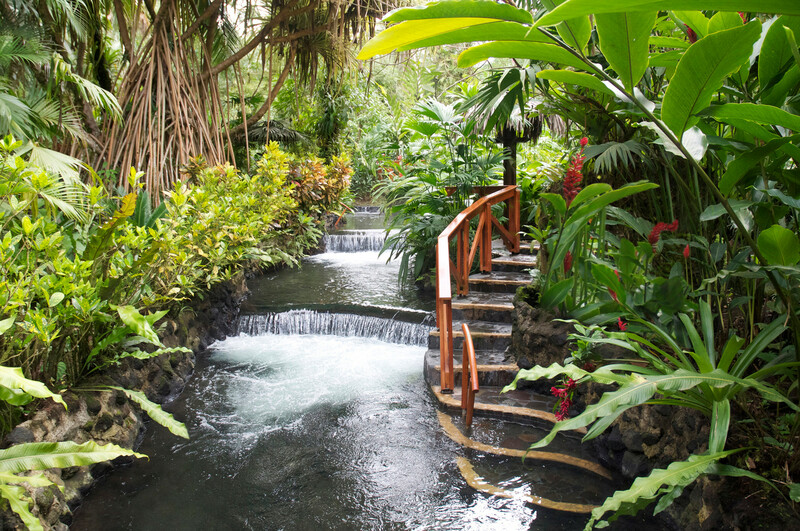 Tabacon Grand Spa offers one-day visit packages that include entrance to the hot springs resorts, use of the facilities and one or two meals at the Ave del Paraiso Restaurant. Rate for kids apply from 5 to 10 years old. Reserve Now with 5% off for reservations in advance. Tabacon Thermal Resort & Spa NIGHT pass. 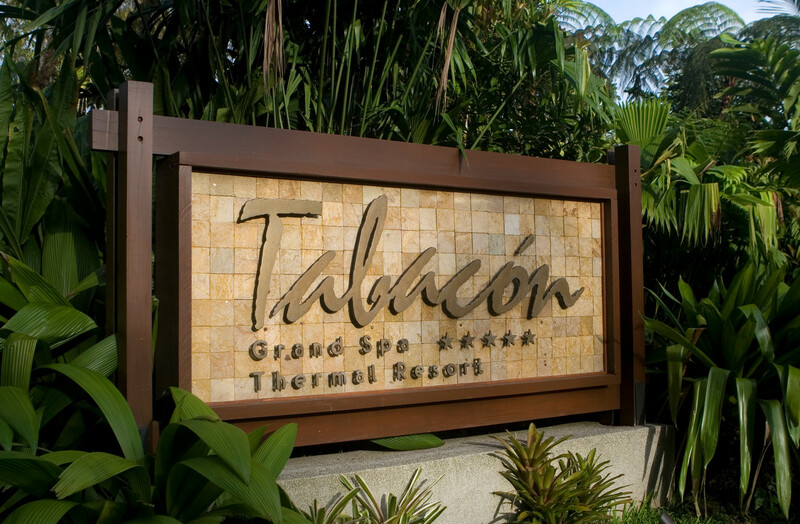 The Tabacon Grand Spa night pass starts at 6 pm daily, and allows visitors to stay until closing at 10 pm. 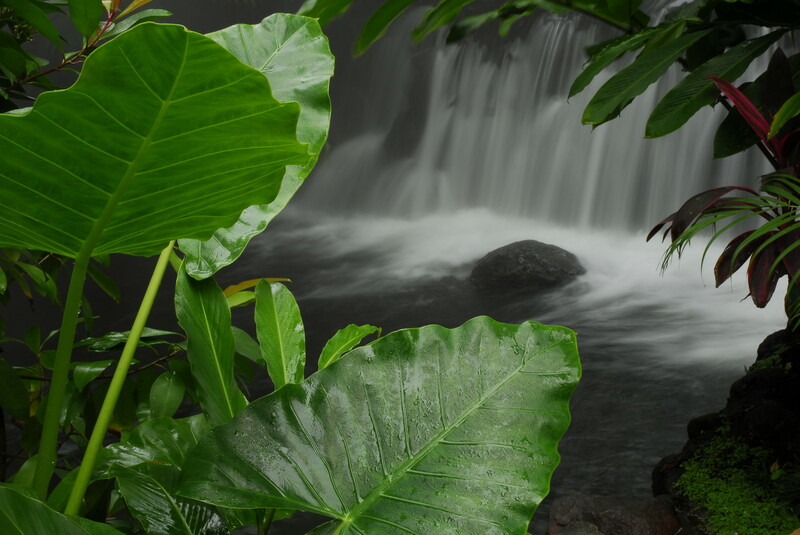 If you plan an active day in the region, and have tours scheduled throughout the day, visit the Tabacon Hot Springs Resort to have the perfect ending to your adventure. At the Tabacón Grand Spa you will find water with the perfect combination of minerals, volume, and temperature. There are many destinations around the world that offer natural hot springs, but few offer the special balance of spectacular cascades and combinations of hot and cool pools that truly make Tabacón a natural paradise. It is a destination that you’ll want to visit on your vacation. It is located 11 kilometers (6.5 miles) from La Fortuna and only 5 kilometers (3 miles) from Arenal Volcano National Park. This makes it close to the principal hotels of the area. 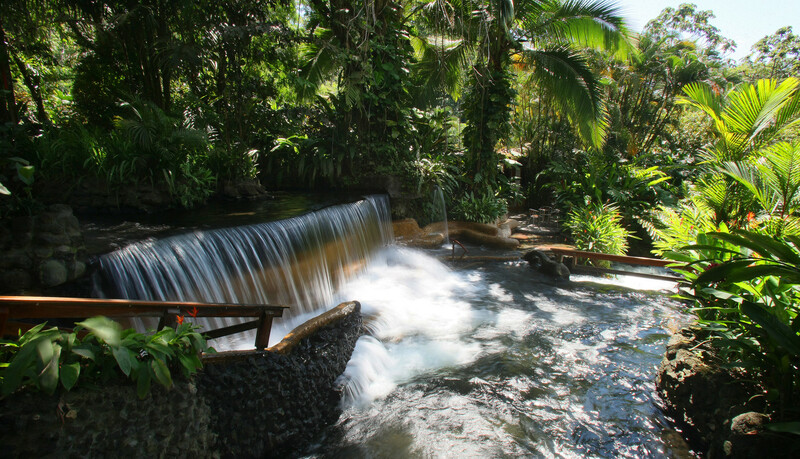 For visitors to the Arenal Volcano area that have decided to stay a few days in a nearby hotel or simply want to spend a few hours in the area Tabacón Grand Spa offers the option to enjoy its hot springs with a day pass. The hot springs are open to the public from 10:00 am to 10:00 pm every day. The Tabacon Grand Spa. The main sunbathing and swimming area features five pools with temperatures ranging from 25 to 38 degrees C (77 to 102 F), the main one with a swim-up bar and thermal water slide. 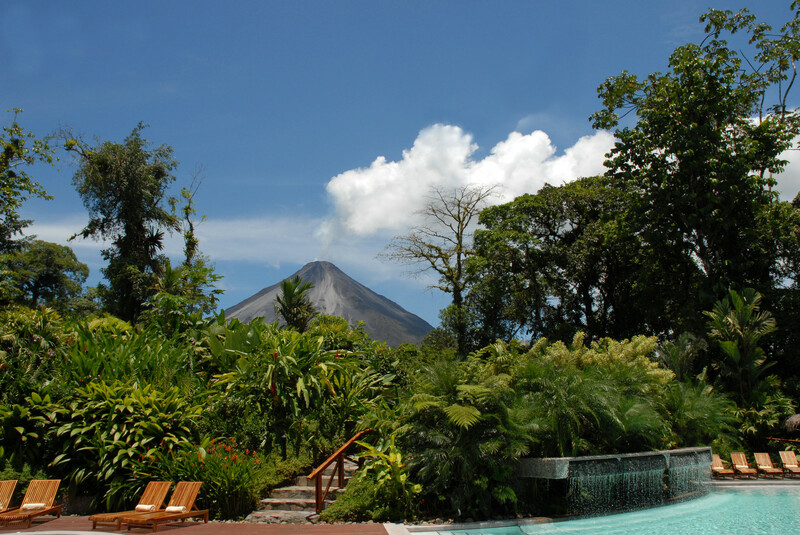 The pools on the lower section offer a more secluded ambiance with spectacular volcano and rainforest views, and they are also within the main service area of the Arenal Swim-Up Bar. The pools are strategically located along the walking trails of the gardens and provide a nice relaxing break from the explorations of the flowers and plants, and the surprisingly regular wildlife sightings.